Compute the average Hamming loss. The Hamming loss is the fraction of labels that are incorrectly predicted. Predicted labels, as returned by a classifier. Integer array of labels. If not provided, labels will be inferred from y_true and y_pred. Deprecated since version 0.21: This parameter labels is deprecated in version 0.21 and will be removed in version 0.23. Hamming loss uses y_true.shape for the number of labels when y_true is binary label indicators, so it is unnecessary for the user to specify. Return the average Hamming loss between element of y_true and y_pred. In multiclass classification, the Hamming loss corresponds to the Hamming distance between y_true and y_pred which is equivalent to the subset zero_one_loss function. 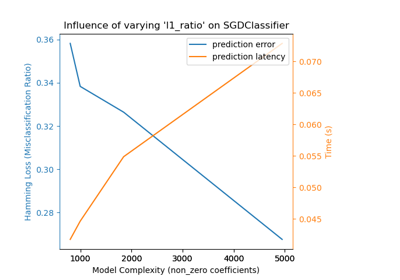 In multilabel classification, the Hamming loss is different from the subset zero-one loss. The zero-one loss considers the entire set of labels for a given sample incorrect if it does entirely match the true set of labels. Hamming loss is more forgiving in that it penalizes the individual labels. The Hamming loss is upperbounded by the subset zero-one loss. When normalized over samples, the Hamming loss is always between 0 and 1. Grigorios Tsoumakas, Ioannis Katakis. Multi-Label Classification: An Overview. International Journal of Data Warehousing & Mining, 3(3), 1-13, July-September 2007.